Waiting out the storm in a rock shelter along Trail 4 at Shades State Park. The rain added an exciting element of adventure to our otherwise routine day hike. Nestled in the farms of central western Indiana are two topographical anomalies... islands of forest scarred with slot canyons and drainages similar to what you'd expect high in the mountains. The parks are home to Sugar Creek, a fast moving tributary that flows from east to west eventually draining into the Wabash River. Turkey Run State Park lies further south and west while Shades State Park, its less popular little brother, sits closer to Indianapolis - just a tad further to the east. The two parks are separated by only five miles but see vastly different numbers of visitors. According to 2011/2012 statistics from the Department of Natural Resources' website Turkey Run S.P. saw approximately 724,000 visitors come through its gates compared to only about 82,000 guests at Shades S.P. The two parks share similar features including slot canyon 'esk' drainages as well as tall rocky buttes and cliffs. I spent part of a Saturday hiking at Shades and the Pine Hill Nature Preserve, nestled next to the park, and was very thrilled with the ruggedness of several of the trails in addition to the picture worthy rock formations and features. While Turkey Run may have more miles of trails and the more awe formations and canyons, Shades has the isolation and the serenity of nature I prefer! We hiked an entire section of one of the trails without seeing another hiker. When I visited Turkey Run, we waited in line to cross the bridge leading into the park. I'm a big proponent of getting away from the well beaten paths of national parks and pushing into the more remote natural areas that national forests and state parks often offer. Shades and Pine Hill do not disappoint! High atop Devil's Backbone in the Pine Hill Nature Preserve. One of the many formations buried in the forest. You'll find plenty of day hike options (and even one short overnight backpacking option) in the park. I noted that the hiking felt more like scrambling in places as we crossed the Devil's Backbone and hiked up the drainage (in the driving rain) on Trail 4 near Sugar Creek. The park and preserve offer about 12 miles of hiking trails many of which are loop trails or can be connected together to form a loop making it easy to park and hike most of the trails in one outing if you have an entire day. While Turkey Run is a state park not to be missed and one which seems out of place in the mundane topography of the midwest, don't succumb to the popularity contest, visit Shades and get some hiking all to yourself with the same scenery. Be sure to check out trails 4 and 5 which follow drainages down to Sugar Creek. Also, a visit to Trail 10 in the Pine Hill Nature Preserve rewards you with formations such as the Devil's Backbone and Honeycomb Rock. Visit in summer when drainages are low and easier to navigate. To see more pictures of Shades head over to my Flickr account. 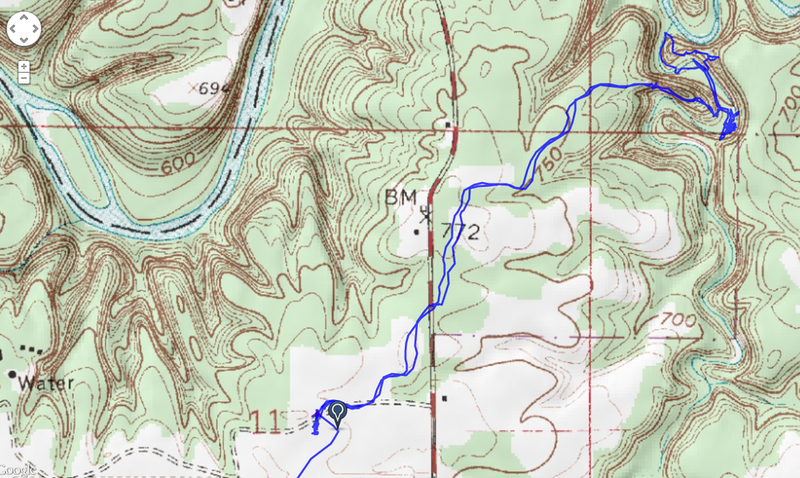 To see an interactive map of the hikes visit my Trimble Outdoors page. I'm looking for great destinations in the midwest to visit. What are your recommendations?